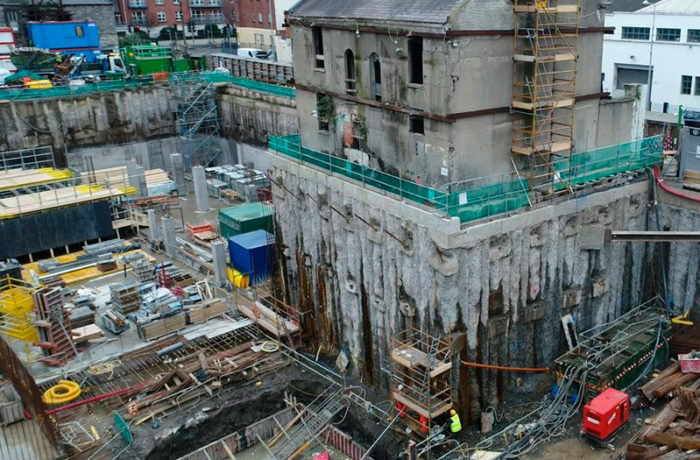 The overall works package comprised of the demolition of existing buildings, structural support, de-watering, secant piling and site clearance works at Barrow Street, Dublin 4. All works have been and are completed within a live and sensitive residential and business quarters in the centre of Dublin city. Design of a detailed Temporary works system to restrain and prop the surrounding listed buildings. Design and installation of de-watering system to assist with water control during bulk dig operations. Develop a systematic cut and lift methodology to deconstruct the existing structures. Stripping out and removal of all internal soft furnishing, fixtures and equipment from listed buildings. Demolition of existing stone buildings, suspended slabs, reinforced concrete walls and roof structures, segregating arisings on site. Design and installation of secant piled boundary wall. Carry out bulk excavation, approx. quantity 44,000m3.